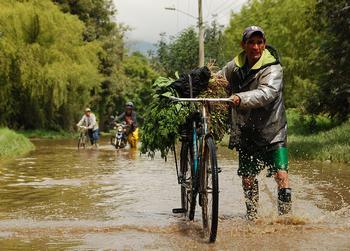 BOGOTA, Colombia, November 30, 2010 (ENS) – The government of Colombia has declared a state of national catastrophe due to the intense rains that have inundated much of the country, causing more than 160 deaths and affecting more than 1.4 million people. This declaration, which applies to 28 of Colombia’s 32 departments, allows the country to access international funds for response efforts. 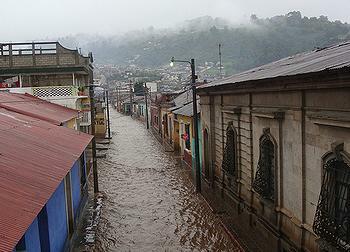 The intense rainy season has left 220 injured and damaged more than 230,000 houses. The heavy rain this rain season has also damaged many main and secondary roadways throughout the country, leaving some areas cut off from assistance. 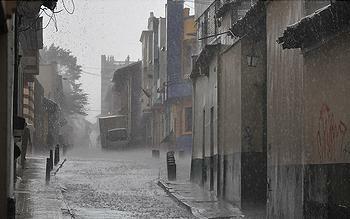 Colombia experiences two rainy seasons – April through June and October through December. This year, meteorologists say, the winter rainy season has intensified due to the onset of La Nina, a cool weather pattern in the eastern tropical Pacific Ocean, which typically produces more rain across northern South America. Weather officials say the heavy rains could continue through January as the La Nina is expected to continue. The National Navy has transported 60 tons of humanitarian aid to Colombian flood victims on the Pacific coast. More than 1,200 families have benefitted in the municipalities of Bacas de Satinga, Lopez de Micay, Docordo and Noanamito. The European Union and the Finance and Andean Development Cooperation have allocated funds for Colombia, while Brazil, Chile, France and Venezuela have sent food, non-food-items and cash aid. Venezuela itself is suffering from damaging floods and a severe rainy season that has affected more than 35,000 people. The Venezuelan government allocated US$170 million for the construction of 2,400 houses in six states affected by rains. The government also approved US$15 million to finish channeling rivers and rehabilitating potable water systems in the state of Vargas, which is one of the worst affected. Venezuelan authorities have distributed more than 150 tons of food to 87 emergency shelters across the country. Venezuelan legislators are in the process of approving the Emergency Housing Law, to assist families who have lost their homes due to rains. The 2010 Atlantic hurricane season ends today, leaving more than 300 people dead across Central America. The hurricane season is blamed for the worst rainy season in Central America in the last 50 years, with flooding and mudslides leading to 300 deaths, mainly in Honduras, Guatemala and El Salvador. Hurricanes also left thousands of people homeless and caused USD$1 billion in damages. In addition, the Economic Commission for Latin America reports that the impact of climate change in the region between 2002 and 2008 is estimated at US$15 billion. According to the commission, if climate change trends continue on their present course, the cost of damages to agriculture, water resources and biodiversity by hurricanes and storms could reach US$73 billion in 2100. This figure is equivalent to 54 percent of the 2008 Gross Domestic Product for the seven countries that make up Central America. Copyright Environment News Service (ENS) 2010. All rights reserved.